An international research team involving the University has tracked the foraging patterns of albatrosses in the southern ocean and found that nearly 80 percent of them follow fishing boats, giving scientists new insight into the risk fishing vessels present to seabirds. The extent to which albatrosses and fishing vessels overlap was revealed by newly developed XGPS radar loggers which were fitted to fifty-three incubating wandering albatrosses. The loggers are able to detect vessel radar by an omnidirectional micro strip antenna integrated with the bird’s geo-positional GPS device. 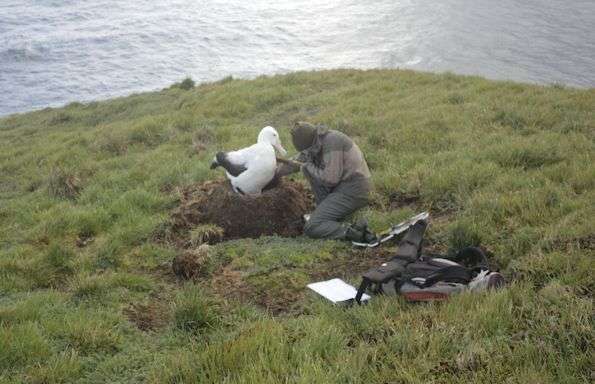 The data showed that during breeding, tagged Crozet wandering albatrosses patrolled over an area of more than 10 million square kilometres and as much as 79.5 percent of the birds equipped with the loggers detected vessels, at distances up to 2500 kilometres from the colony. About 300,000 seabirds are killed annually in longline fishing, including albatrosses which are an endangered species and one of the most threatened families of birds internationally, with 15 of the 22 species in the group threatened with extinction. The study took place in Possession Island in the Crozet Islands, in the southern Indian Ocean, from January to March in 2015 and 2016 and the research team included the University, the Centre d’Etudes Biologiques de Chize, France, Sextant Technology Ltd and the Museum of New Zealand Te Papa Tongarewa. The paper `Use of radar detectors to track attendance of albatrosses at fishing vessels’ is published in the Conservation Biology online journal. This entry was posted in 2017, International, X and tagged albatrosses, foraging, seabirds on 2 Jul, 2017 by Birdlife20 owner. This entry was posted in 2017, International, X and tagged albatrosses, conservation, human impact on 25 Jun, 2017 by Birdlife20 owner.